Panasonic pushes ahead of the competition again, with a new design that is both functional and attractive. The massage chair industry has long been criticized for having a less than appealing style. Traditionally, a massage chair would be a glaring centerpiece and incapable of camouflage in a stylized home. 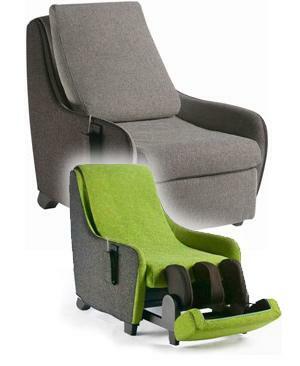 Innovations in deep-tissue relief techniques overpowered the aesthetic design of the massage chair. Panasonic is hoping dispel some of the negative stylistic connotations associated with massage chairs, and push design into the future with the unveiling of the MS40. Dr. Alan Weidner is pleased to announce that http://www.massage-chair-relief.com is now carrying the Panasonic MS40 massage chair. The big question coming from the massage chair industry was would this focus on style and chic from Panasonic be detrimental to the functionality of the chair? Panasonic has a considerable amount of sway in the massage chair industry. They designed and constructed the first massage chair to be approved by the American Chiropractic Association and their impressive selection of chairs have been leading the industry ever since. So with this new chair Panasonic had room to lose, but it seems as though they did not have to worry about releasing a new product that would tarnish the regarded Panasonic name. The first thing that is striking about the chair is its compact design - a slim 7.1” massage head is combined with a 25.6” curved track. Compared to other chairs, the MS40 is compact and subtle in design. Another feature of the MS40 that many other chairs bypass is the fold-in ottoman. The ottoman can be neatly stored away from view when not in use and easily accessible via the release strap and completely deployed by pushing down with the feet. The MS40 is not a reclining chair and in this regard, this is where the chair loses some of the functionality that has become almost standard in the industry. Panasonic states that their precision engineering actually makes the need to recline redundant. They claim that the smaller curved track and massage head allow the massage block to easily conform to the body, administering a precise massage from the neck to the lower back. The four preset functions of the chair are somewhat standard and nothing is notably progressive about them. However, when you consider that a competitive deep-tissue massage is finally available from a stylish chair, the functions of the unit hold up well to the competition. The Panasonic MS40 is undoubtedly designed to look at home in a modern house decorated with contemporary furnishings. The color schemes, the choice of fabric and wood, all compliment a modern home designed in this popular way and for those who are looking for a chair that is not a gaudy statement to the pursuit of muscle relief, this design is more than welcome. The Panasonic MS40 has finally bridged the gap between functional necessity and a demand for style. For more information on the features and functions of the Panasonic MS40, contact Dr. Alan Weidner in person at 801-417-8240 or visit http://www.massage-chair-relief.com/massage-chairs/panasonic/panasonic-epms40-massage-chair/ to read more information on the MS40 including some revealing user reviews.